What do you get when you take a cold, Northern climate dotted with a small yellow house filled with sick, lethargic kids needing lots of cuddle time from a tired, feeling under-the-weather-herself mommy? Let me tell you. 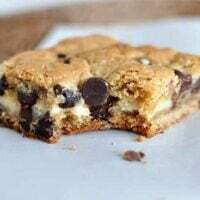 You get a lot of warm, little bodies snuggling together on the blanket-laden couch drowning their sniffly worries in cheesecake stuffed chocolate chip cookie bars, PBS for Kids, and tissues. Lots of tissues. It’s been a long week and it’s only Wednesday. I’m off to play nursemaid. But you? You should definitely make these bars. They are amazingly, tremendously, awfully wonderful. Preheat the oven to 350 degrees F. Line a 9X13-inch pan with aluminum foil and lightly coat the foil with nonstick cooking spray. Set aside. For the cookie layer whisk the melted butter and sugars in a large bowl until combined. Add the egg, egg yolk, and vanilla and mix well. Add the flour, salt and baking soda, folding into the dough with a rubber spatula; do not overmix. 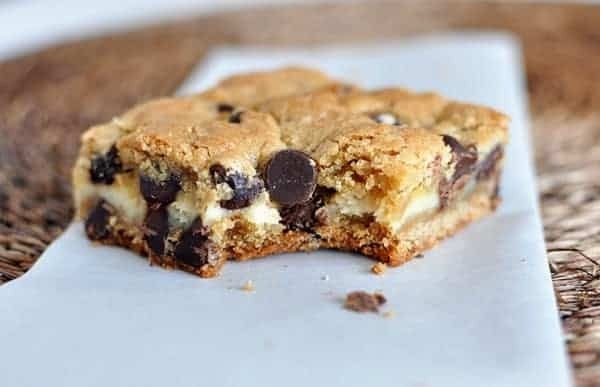 Fold in the chocolate chips until combined. Press half of the dough onto the bottom of the prepared pan. It will be a thin layer, so use lightly moistened hands to press the dough into a thin even layer, filling in any holes with a bit of cookie dough from the bowl. For the cheesecake filling, mix the cream cheese and powdered sugar together with an electric mixer on medium-high until light and fluffy, 1-2 minutes. Add the egg and vanilla and mix until well combined. Spread the cheesecake filling over the layer of cookie dough in the pan. Using the remaining cookie dough, flatten tablespoon sized amounts of cookie dough in your hands into flat disc shapes, about 1/8- to 1/4-inch thick. Place these discs over the top of the cheesecake layer, pressing very lightly to adhere them to the cheesecake layer. It's ok if there are small spaces; the entire top doesn't need to be completely covered just make sure it is mostly covered with cookie dough. Bake the bars for 35-40 minutes until very lightly browned on the edges. Remove to a wire rack to cool completely. Refrigerate until chilled, 1-2 hours. Cut into squares and serve. Store covered in the refrigerator for up to 2 days. To make it easier to put the top layer on over the cream cheese, line the pan with aluminum foil spread the thin layer into the lined pan. Remove that layer from the pan and put it aside. Now create the bottom layer as directed in the recipe, add the cream cheese layer, top with the pre-formed top layer. Hey! Delicious! I found that there even better with a tsp if cinnamon in the cookie dough!! These are one of our favorites. My daughter’s softball team always asks me to make them. Today I made them with the new Ghirardelli caramel chips and they were amazing. Think caramel cheesecake. Mmmmm! Everyone needs this deliciousness in their lives. Make them. You’ll be happy. They were a hit tonight at a get together. Yummy! Finally got around to making these today. WOW! They are awesome! Very easy to make, as well. Thanks for the recipe! I decided to give this a try the other day, and it turned out great! Everyone in my family devoured them– they were definitely a big hit! I followed the recipe exactly as written, and wouldn’t change anything if I make them again (and I definitely am planning to!). These would be great for a bake sale as well. I would definitely recommend giving these a try! These are so delicious. We loved them. Easy to make, and we didn’t have any issues with the dough being messy-pressed very easily into the prepared pan. I did spray the cooking spray directly on the glass pan and left the foil step out-maybe that made a difference…. I can see why putting the foil on would be nice though -to pull out and cut, but for us just leaving them in the pan worked well. Ohhhhh… These sound delicious! What could be better than anything cheesecake and chocolate? Flour, vanilla, rest of ingredients… Check! Looking in the fridge now. I made these last night and brought some into work this morning for a Friday treat. They are SOOOO tasty. I’ll admit, like others, I couldn’t wait for them to cool last night and tried a bite warm. While still crazy delicious, after they are cold they are SOOOO much better, but I always feel that way about cheesecake, it HAS to be cold. Thanks for the recipe! As always you never steer me wrong. Just got these into the oven. The dough came together super easily but it was so messy pressing it into the pan and then trying to drop it on top of the cheesecake layer. I think next time I may chill the cookie dough before trying to spread it. Or at least while I’m making the cheesecake layer then hopefully the top crust would be less messy. just tried making these, they are in the oven now! Had some issues with the dough not being “doughy”. It was very hard to deal with, anyone have an issue with this??? Made these for SupberBowl as dessert. MMMMMM MMMMMM! So good! Easy to put together…had the kiddos help me! Super yum! So good! But for us it definitely needed to be followed up with a glass of milk. Well, since I’ve seen this recipe twice from two different sources in two different days, I took it as a sign. Yum! These sound so unbelievably delicious. Awesome recipe! I made these yesterday for our youth group last night. They were so good the teens were fighting over who got the last piece! I will definitely make these again! I can’t wait to try these this weekend! Saw this post and promptly made them for an after-school treat. With the chaos of the day, however, they were just coming out of the oven (instead of the fridge) when the kiddos got home. Luckily, they did not complain about the experiment of tasting them before and after chilling. Question: in all seriousness – how do you make treats for your family and stay thin? I need to know the secret. I am really overweight and struggle with feeling like I just can’t have treats in the house, but still want to be the Mom who bakes for her kids periodically. I know there needs to be a balance — how do you create that? Definitely doing these tomorrow 🙂 Thanks again! I have these chilling in the fridge right now. They smell SO GOOD I am tempted to eat them warm. Can’t WAIT for my husband to get home for lunch so we can eat them! Thank you so much for the recipe Mel! I hope you and your family are feeling better soon. Hi Danette – it’s actually not something you can just put in with a widget. I had to have it specially coded and inserted into the back end files of my website. Sorry it’s not easier! Can’t wait to try these bars! On a different note, I love your share buttons with the cute whisk icon at the bottom of each of your posts. Would you be willing to share how I can do that in Blogger? Hope you all get feeling better soon. If I had these bars when I was sick, I would get better really, really soon! Bless you! These look heavenly! Hope your family feels better soon! Mel, I’m hoping everyone is better quickly. These would make me feel good. I hope you and your little ones feel better soon. 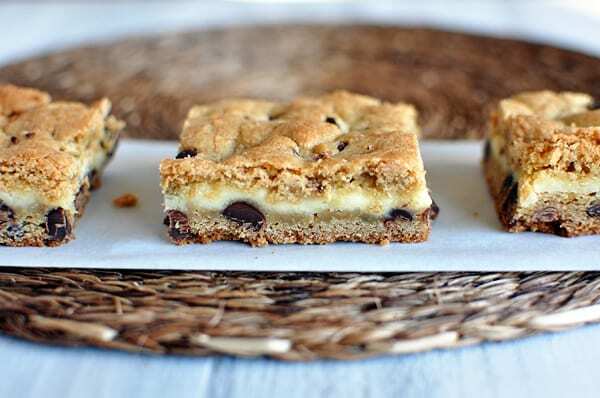 We’re having huge storms in our area, and I think these cookie bars will make the day so much better. Luckily I have all the ingredients on hand so I won’t have to go out in this weather. Oh my! These look divine!! Sorry to hear you are all feeling low. We had that recently and it was tough — especially since the flu was staggered in our house and the kids were getting better when I wasn’t! I hope everybody feels better soon! My 3yo daughter saw this and said, “I want to eat the computer!” I guess we’ll be trying these soon! Oh, Mel…I’m so sorry you and your little ones are all sick. I hope you are all feeling better soon! These bars look incredible. I’m going to make them for the Super Bowl on Sunday. I think they will be the perfect sweet treat!